OPEN CALL FOR CONTEMPORARY DANCERS BASED IN BUDAPEST FOR A PROJECT AT SZIGET FESTIVAL! Liesel Zink, Australian choreographer will be the guest of the The Dance and Theatre Venue of Sziget Festival this year. Liesel will recreate her piece The Stance with local dancers. The Stance is a monumental dance and sound performance that investigates the choreography of bodies in protest and questions what it means to put your body on the line for something you believe in. Both highly political and physically demanding, The Stance is an imposing act of endurance that channels the history of public protest and recent acts of global action, activism and intervention. The Stance is recreated each time with the local participants influenced by the local environment, politics and public life of the given place. We are looking for six local contemporary dancers to create the Budapest edition of The Stance with Liesel Zink, three other Australian dancers and Mike Willmett, musician. 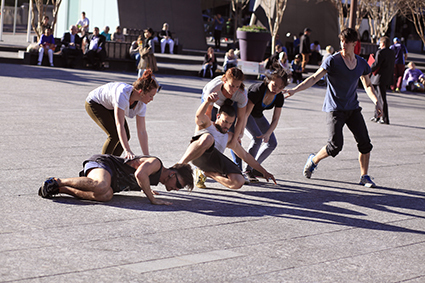 Liesel Zink is a Brisbane based choreographer inspired by politics, psychology and social psychology. She is currently researching the political body in public space under a social psychology framework. As an independent, she works with key collaborators sound artist Mike Willmett and dramaturge Martyn Coutts to create large scale dance and sound works in busy urban spaces, conducting social experiments amongst the busy flow of pedestrian traffic while exposing artistic process and practice to new and extensive audiences. Please send your application to info@sinarts.org – in the subject please write: The Stance project. We will notify all applicants until 23 June 2017. The selected participants are obliged to be present for all rehearsals and performances.